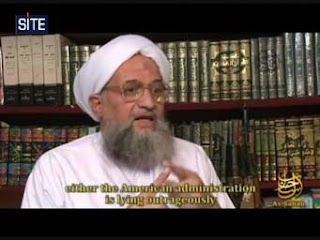 Al-Qaeda’s second in command Ayman al-Zawahiri released an internet video where he said that after the US leaves Iraq (The Obama Plan) Al-Qaeda will proceed from there and take Jerusalem. Al-Qaeda’s deputy leader Ayman al- Zawahiri defended insurgent attacks in Iraq, Algeria and Morocco that killed Muslims and blamed the West for using them as human shields, according to a U.S.-based intelligence group. Zawahiri said he expected the jihad, or holy war, to move to Jerusalem when U.S. forces leave Iraq. Laura Mansfield has the transcript of the Zawahiri speech. First: I expect the Jihadi influence to spread after the Americans’ exit from Iraq, and to move towards Jerusalem (with Allah’s permission). As for the militias mentioned, they have failed to eliminate the Jihad with the help of what is called the strongest power in the history of mankind, so will they succeed by themselves or with the help of Iran?